Taking a break from painting, (from left) Dyelle Washington, a sophomore at Renaissance Academy, MD First Lady Yumi Hogan, UMB President Jay A. Perman, MD, and Renaissance Academy Principal Tammatha Woodhouse, pose for a picture in front of the colorful mural. “One… Two… Three… Let’s paint!” exclaimed Tammatha Woodhouse, the principal of Renaissance Academy High School. And with that, a group of high school students – with the help of Maryland First Lady Yumi Hogan – began putting the finishing touches on a brand-new mural inside the school. By about noon on April 5, the students could stand back and marvel at the completed work of art. What was once a plain, white stretch of hallway is now a rainbow of colors bringing new life to the third floor of Renaissance Academy. The myriad of colors swirl together in pointed shapes surrounding silhouettes of students who are dancing, celebrating, and graduating. 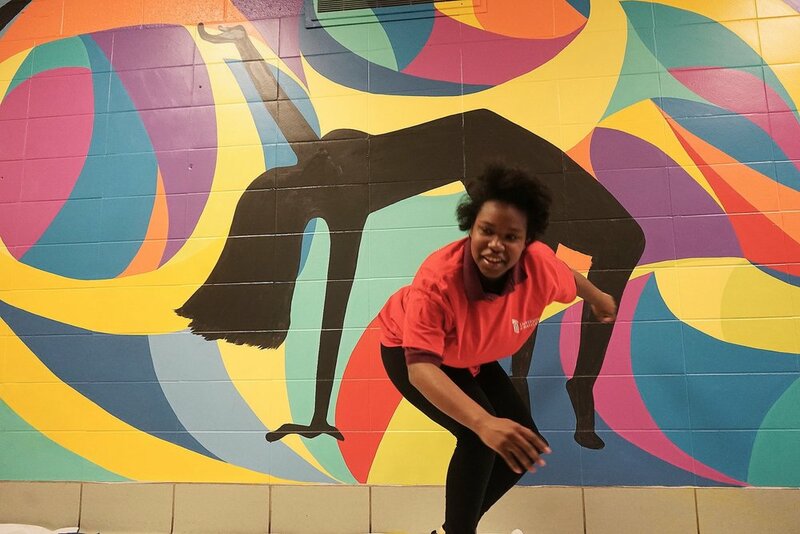 Dyelle Washington, a sophomore at Renaissance Academy strikes a similar pose to the mural she stands in front of and helped to complete. The mural at Renaissance Academy is the third in an ongoing public mural series facilitated and sponsored by the University of Maryland, Baltimore (UMB) Council for Arts and Culture, for which First Lady Yumi Hogan is honorary chair. In fact, it was the First Lady who came up with the idea to have the council commission public murals at UMB’s many partner schools in West Baltimore neighborhoods. Renaissance Academy was an ideal choice for the mural series because it’s part of the University of Maryland School of Social Work-led program, Promise Heights. 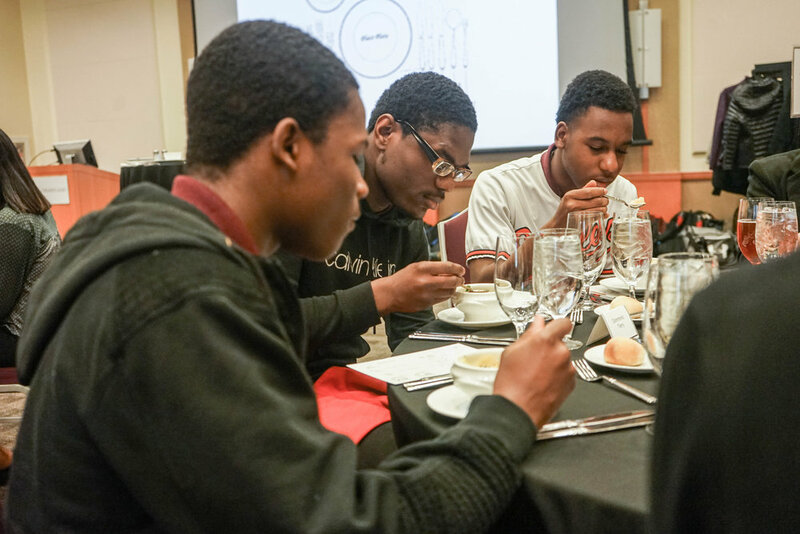 Promise Heights is a cradle-to-college and career approach aimed at closing the opportunity gap in the West Baltimore communities of Upton/Druid Heights. Members of the council hope that this mural will become yet another pillar of support for the students at Renaissance Academy, and that it will demonstrate the power that art can have on the mind and body. “This mural series is all part of UMB’s holistic view that the arts can help people heal and work through crisis and trauma. It’s also the perfect way to show that the arts go hand-in-hand with fields like medicine, nursing, and social work,” said Jennifer B. Litchman, MA, senior vice president for external affairs and chair of the Council for Arts and Culture alongside the First Lady. The council had been working in tandem with a group of students at Renaissance Academy for the past year to determine the theme and artwork of the mural. Finally, they were able to narrow it down to three art concepts, and the school got to vote on which one they wanted to see in their hallway. 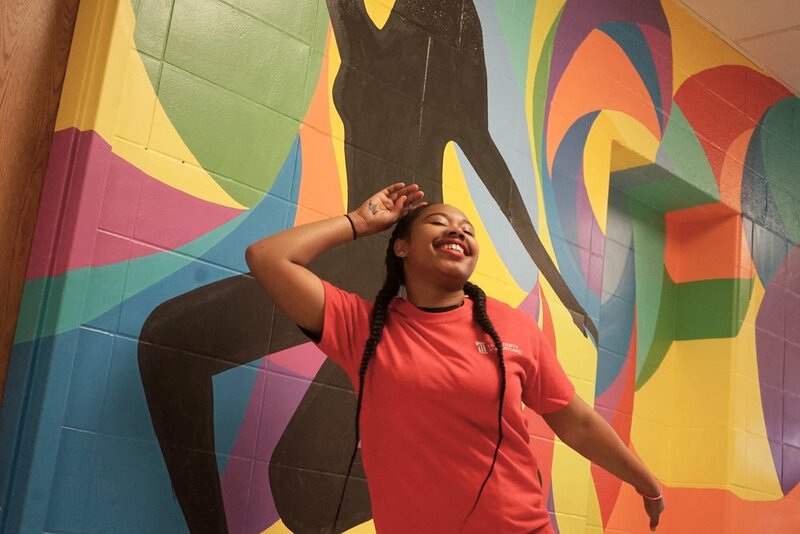 A Renaissance Academy Student poses and dances in front of the colorful mural. The artist behind the mural, Candace Brush, really took Woodhouse’s sentiment to heart. Before sketching out a design, Brush talked to the students about what they wanted to see and what would best represent them in the mural. Through those conversations, Brush was hit with a stroke of inspiration. The appreciation showed through each of the students who were thrilled to see the mural finally completed. To them, the work of art is more than just color schemes and patterns. It represents companionship, commitment, friendship, and fun. It also symbolizes their own journeys through high school. 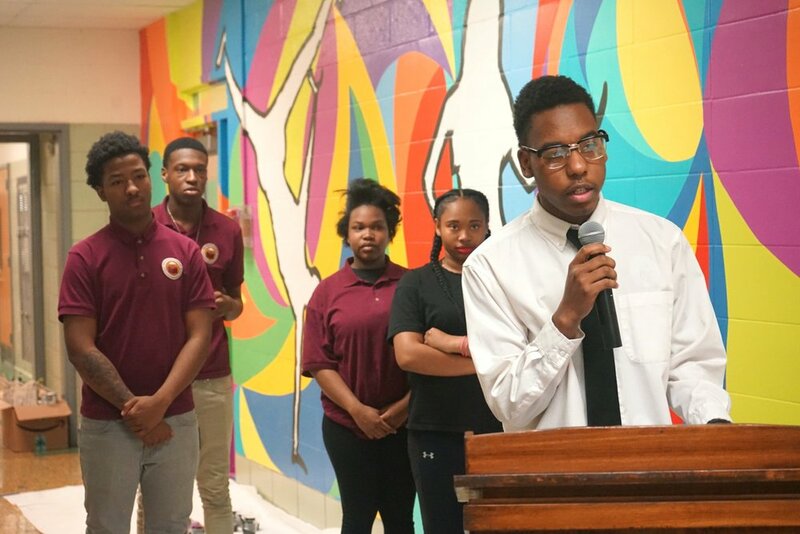 With the support of his classmates behind him, Kevin Flemming, a junior at Renaissance Academy delivers his speech to the audience during the mural unveiling. Woodhouse hopes that her students take away another lesson from this mural. She hopes they can have a new appreciation for art and how it can evoke thoughtfulness and inspire a new perspective on learning. During the mural unveiling, UMB President Jay A. Perman, MD, announced yet another way that Renaissance Academy is moving forward. Through Promise Heights and a grant from the U.S. Department of Education, UMB has been able to sponsor the first class of Renaissance Academy students who will be trained and certified as phlebotomists. Perman explained that an instructor from Baltimore City Community College has been teaching the course at the high school. Then, in June the students will be able to do their clinical practice at the University of Maryland Medical Center. In the meantime, the Council for Arts and Culture is still reviewing where they will paint the next mural in the series. The first two are on display at James McHenry Elementary/Middle School, which partners with UMB through the Social Work Community Outreach Service, and Southwest Baltimore Charter School, which partners with UMB through the CURE Scholars Program. Students from Renaissance Academy High School and staff including Promise Heights College and Career Coordinator, Shirley Green (second to the left) and Promise Heights Director, Bronwyn Mayden (third to the left) gather for a group photo following the etiquette dinner at the University of Maryland, Baltimore Campus Center. Three students from Renaissance Academy High School cool their soup. French onion soup was the first course of a four-course etiquette dinner at the SMC Campus Center, U of Maryland. 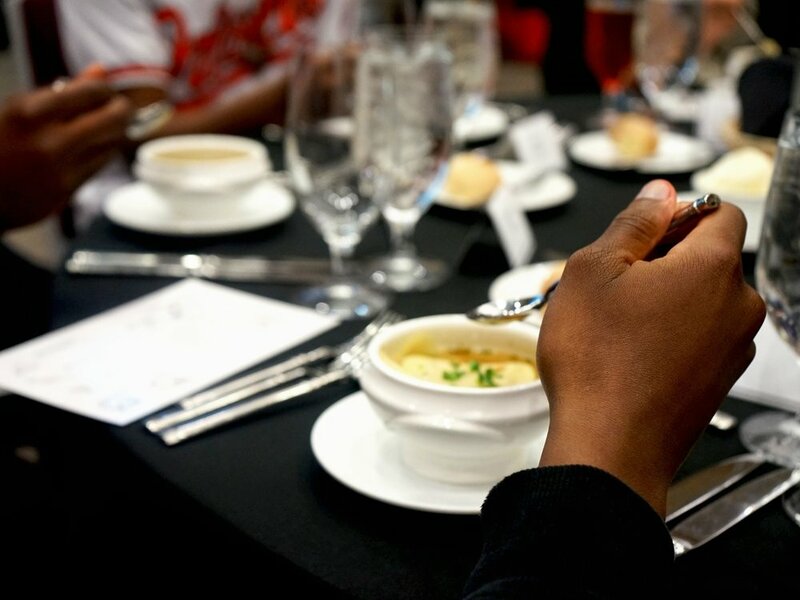 Students exhibit the proper spoon placement during the meal’s first course. Since Washington Post journalist Theresa Vargas first covered Khalil's journey on June 13th, over 411 people from all over have donated to the GoFundMe set up by Hallie Atwater, Renaissance Academy's Community School Coordinator, to exceed the initial goal by almost $10,000 and still going! We could not be more proud of Kahlil for all that he has achieved and are confident that he will be able to achieve his dreams. On June 23rd The Washington Post wrote a follow up article, "'Soar Khalil soar!' Nearly 250 strangers give a Baltimore teenager $30,000," about the widespread support that Khalil has received and his plans for the future which include attending a 4 year institution and becoming an athletic trainer of physical therapist. You can read that full article here. In a letter to editor published by The Washington Post on June 22nd in response to the June 19th article "Coming of age in a city coming apartment," Richard P. Barth, Dean of the University of Maryland School of Social Work, spoke regarding community schools and how they support schools in a holistic way to provide for students, families, and staff.